Facebook advertisement studies: Their ads are more like TV ads than Google ads. Even if you never click on Facebook ads, they are making you buy things. Facebook ads don’t need to be clicked on to be effective. And that’s not all. You’ve checked with your friends and relatives. No one you know has ever intentionally clicked on a Web ad. OK, once, years ago, a co-worker told you about a guy who knows a guy who tapped an ad on his phone. True story! But don’t worry. People close to the situation dismissed it as a one-time deal. The guy wasn’t trying to tap the ad; he just had really fat fingers. He felt really bad about it afterward, too. So, the question persists: How does Facebook expect to become a huge business if most people you know never click on ads? This isn’t conjecture. It’s science. It’s based on a remarkable set of in-depth studies that Facebook has conducted to show whether and how its users respond to ads on the site. The studies demonstrate that Facebook ads influence purchases and that clicks don’t matter. They also shed light on Facebook’s long-term business strategy. The tech world is consumed by the war between Facebook and Google—two huge sites that are constantly battling one another for users, engineers, and advertising clients. Yet Facebook’s studies suggest that its advertising fortune won’t necessarily come at the expense of Google. Instead, the findings show that people react to ads on Facebook in the same way they respond to ads on television. If Facebook’s ad business takes off, it might be at the expense of the biggest ad-supported medium in the world. Last year, Facebook partnered with Datalogix, a firm that records the purchasing patterns of more than 100 million American households. When you stop by the supermarket to buy Tide, Rice-A-Roni, and Mountain Dew this evening, there’s a good chance you’ll hand the cashier a loyalty card to get a discount on your items. That card ties your identity to your purchases—it puts a name on your Tide, Rice-A-Roni, and Mountain Dew. After you leave the store, your sales data is sent over to a server maintained by Datalogix, which has agreements with hundreds of major retailers to procure such data. These general insights make a strong case for Facebook ads. First, according to the study, Facebook ads work. “Of the first 60 campaigns we looked at, 70 percent had a 3X or better return-on-investment—that means that 70 percent of advertisers got back three times as many dollars in purchases as they spent on ads,” says Sean Bruich, Facebook’s head of measurement platforms and standards. What’s more, half of the campaigns showed a 5X return—advertisers got back five times what they spent on Facebook ads. But the most interesting finding was the total lack of correlation between purchases and clicks. “On average, if you look at people who saw an ad on Facebook and later bought a product, [fewer than] 1 percent had clicked on the ad,” Bruich says. In other words, the click doesn’t matter; people who click on ads aren’t necessarily buying, and people who are buying are almost certainly not clicking. This shouldn’t surprise you, because it’s how most other ads work. There are generally two kinds of marketing messages in the world—“direct-response” and “demand-generation.” Direct ads are those that call on people to take an action more or less immediately—click to visit a site, call an 800 number, order something from a catalog. Google’s Adwords, the little text ads that show up alongside your search results, are a form of direct ads. Adwords are supremely measurable—advertisers pay Google for clicks, and they can track how many of the people who click end up buying from their site. Adwords are also extremely effective; because they’re shown to you when you’re looking to buy something (when you have “high purchase intent,” in the jargon), people who click on them frequently end up buying. Consequently, Adwords have made Google the most successful advertising company in the history of the world. Yet in the larger advertising industry, direct-response ads like Google’s are something of an anomaly—a way to sell certain products at certain opportune times, but not the way that most marketers approach their jobs. Instead, the vast majority of the advertising world is structured around “demand generation.” These ads aren’t trying to get you to take some action right away. Instead, they’re trying to plant an idea in your head—to introduce you to a new product, to get a name stuck in your head, to improve how you feel about a company. (That’s why demand-generation ads are also known as “brand advertising.”) Other than infomercials, pretty much every ad you see on TV is a demand-generation spot. That’s true of ads in print magazines, on the radio, at bus stops, on billboards and most of the banner ads on your favorite news websites, too. According to some estimates, demand-generation ads account for more than 80 percent of the money spent on ads. Facebook has been selling itself as an ideal venue for brand advertising for several years now. That’s not just because there’s a lot of money in brand ads; it’s also because Facebook has long seemed like a relatively poor environment for direct-response ads. People who go to Facebook do not have high purchase intent—they’re going there to catch up with their friends, not to search for something to buy. Of course, that’s true of TV, too—no one sits down to the tube expecting to find new stuff to buy. Usually we just want to goof off. 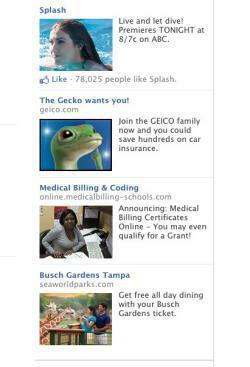 There’s another way in which our Facebook use resembles how we watch TV: We spend a lot of time there. People spend about 7 hours a month on Facebook, more than on any other site. One of the only things we do more often than waste time on Facebook is watch TV. We do that a lot more often, clocking in an average of about 5 hours a day in the United States. But demand-generating advertising has been a relatively tough sell for Facebook. That’s because the online ad business is structured around measurement—around advertisers’ ability to precisely track how people are responding to their ads—and brand advertising is notoriously difficult to measure. The lack of measurement explains why some advertisers have been so skeptical of Facebook—see General Motors’ very public denunciation of the site last year. Again, though, it’s useful to compare Facebook with television. In its early days, TV also had a problem with measurement. No one knew how to tell whether commercials were really working. But in the 1970s and ’80s, advertisers and analytics firms like Nielsen came up with a variety of ways to analyze ads on the tube. Among other things, they instituted standardized measurements to compare TV to other media—like “gross ratings points”—and, after surveying consumers’ purchases, they figured out how people’s TV viewing affected their buying habits. Today, thanks to a practice known as “mix modeling,” the return on TV advertising is exquisitely measurable. Large advertisers like Procter & Gamble know exactly how much they’re getting out of it—and that’s why, despite all the many other devices that now intrude our lives, TV advertising rates remain as high as ever. Now Facebook is trying to bring to the Web same rigorous metrics that have ruled brand advertising on television. “We’re trying to create industry standards around how people advertise online,” says Brad Smallwood, the Facebook vice president in charge of its measurement and insights team. At the core of this work is Facebook’s partnership with Datalogix, though given Facebook users’ (justifiable) squeamishness about how the site uses their data, Facebook and Datalogix had to perform their analysis very carefully. What they came up with was a Rube Goldbergian system that strips out personally identifiable information from the databases at Facebook, Datalogix, and the major retailers while still matching people and their purchases. The system works by creating three separate data sets. First, Datalogix “hashes” its database—that is, it turns the names, addresses and other personally identifiable data for each person in its logs into long strings of numbers. Facebook and retailers do the same thing to their data. Then, Datalogix compares its hashed data with Facebook’s to find matches. Each match indicates a potential test subject—someone on Facebook who is also part of Datalogix’s database. Datalogix runs a similar process with retailers’ transaction data. At the end of it all, Datalogix can compare the Facebook data and the retail data, but, importantly, none of the databases will include any personally identifiable data—so Facebook will never find out whether and when you, personally, purchased Tide, and Procter & Gamble and Kroger will never find out your Facebook profile. Facebook has already begun to improve the effectiveness of ads on its site. One of its findings, for instance, is that for particular brands and product types, there is a “sweet spot” for ad impressions—an optimal number of times to show an ad to a user before the message becomes ineffective. By homing in on that optimal rate, Facebook was able to improve the return on investment of some campaigns by 40 percent. It also found that by customizing the frequency of an ad based on factors like how often a user purchased a certain brand or product category, the company could improve return on investment by 22 percent. Certainly that’s good for Facebook and for advertisers. But it’s also not terrible—and might be even good—for users. If Facebook’s research shows that companies were wasting money by serving some people the same ad too many times, that could mean you’ll be subjected to that kind of thing less often in the future. As Facebook’s measurement systems improve, you might even see better ads—one of the eventual goals the system, Bruich says, is to figure out what kinds of ads appeal to what kinds of users, so over time you’ll be presented with ads that are less likely to annoy you. And if, as you insist, ads really don’t work on you—that you never buy things because of marketing you see on Facebook—it’s theoretically possible that Facebook’s system would be able to figure that out, too, and maybe the site won’t show you any messages. But that’s unlikely. You may not love the ads you see—and you’ll still never click on them. But unbeknownst to you, Facebook ads still work on you. Resistance is futile.